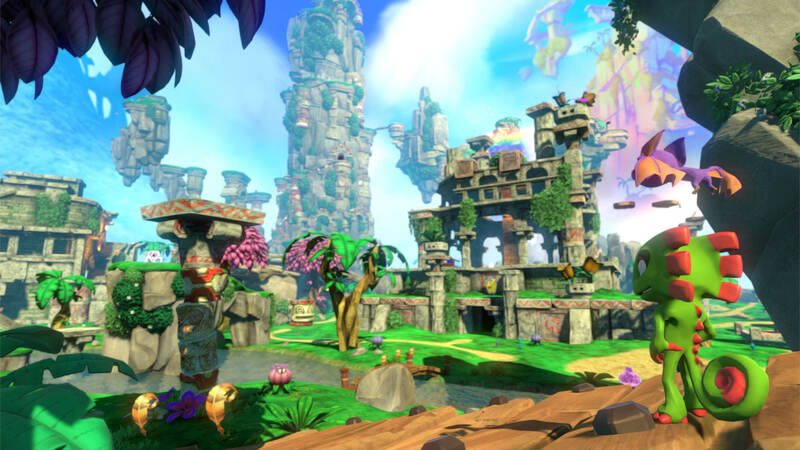 I tried the Toybox demo for Yooka-Laylee a few months ago and was really impressed, it screamed Banjo and the classic Rare era of platformers. The demo itself had so many nods to the game, from the music to the script that I knew they had something special here. Finally, the game is here and it’s more than I could have asked for. The story follows Yooka and Laylee who storm the office tower of the evil Capital B who is stealing pages from all books, but to assemble the golden pagies for some plot. It’s about a basic a plot as you can get, but it does enough to get you to climb to the top and kick his backside. But stopping you are a number of worlds, full of pagies and quills to collect. Think of pagies as Jiggies and quills as musical notes, they function in exactly the same way. You can exchange quills for moves from Trowzer the snake (Yes, seriously…that’s his name) that help you complete the quests to gather more pagies and access other areas of Capital B’s tower. The worlds vary from tropical paradises and snow worlds to swamps and casinos. The challenges that befall you are very Banjo-esque, such as getting through a number of checkpoints in a time limit to beating bosses and using gained moves to access areas you couldn’t before. There’s even a number of quizzes in the tower that is obviously a nod to the classic quizzes from Banjo-Kazooie and Banjo-Tooie. Each of the worlds can be expanded with pagies to increase the amount you can collect. Each world has 25 pagies and 200 quills, as well a health extender, power extender, arcade coin to play the world’s individual arcade machine and a DNA-looking thing called a mollycool that Dr Puzz can use to transform you into different creatures/items like a plant, a group of piranhas and a snowplough to name a few…much like Mumbo Jumbo did in Banjo. Getting around is simple enough, holding down R can make you roll fast…as long as your power meter isn’t empty, but you can collect butterflies as you do to regain energy or health if you aren’t rolling. Much has been complained about the game’s camera, but I honestly don’t see the problem myself…sure, it does sometimes force a perspective on you and that can be irritating, but the rest of the time it is fine. I also don’t see any performance issues, the game hasn’t produced a single bug/glitch or framerate drop in the time I’ve played it…and I’ve played it a lot. Visually, the game is beautiful, colourful, vibrant and full of life. The characters are well animated and detailed, while the soundtrack from Grant Kirkhope of Rare fame does another amazing job. You’d be easily fooled into thinking you were listening to a Banjo soundtrack throughout. 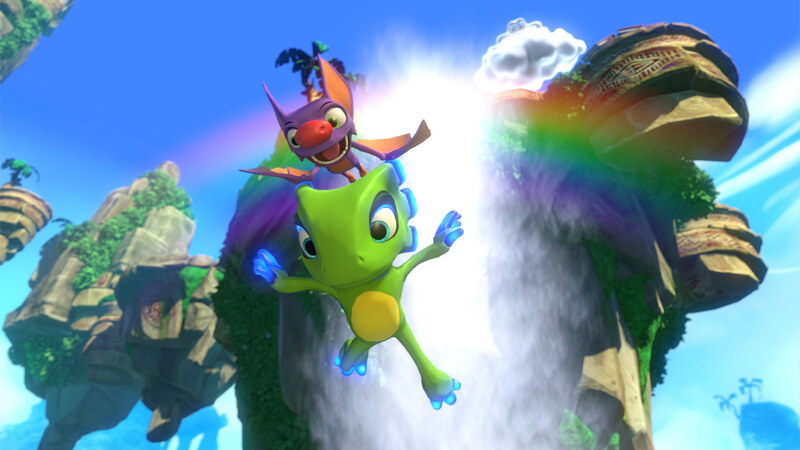 Yooka-Laylee is exactly what we and the Kickstarter fans wanted. A spiritual successor to Banjo-Kazooie/Tooie and that’s what we got. It more than delivers on this promise and I honestly don’t see what anyone else was expecting, so I don’t get why other critics have been so harsh on it…It baffles me, it really does. Banjo was my favourite game growing up, I completed it more times than I can remember and will do so many more times, as I will this. The bottom line is that if you loved the Banjo games, then this is definitely a must-have for your collection. If not, then seriously…what is wrong with you? Also, Playtonic Games….please make a sequel!